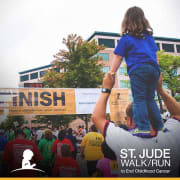 It is time to start planning the 2019 Columbus St. Jude Walk/Run to End Childhood Cancer! This event takes place in September and relies on our dedicated committee members who meet monthly to organize event details and logistics. We are seeking creative, passionate, and organized people to join our St. Jude Walk/Run Committee. This is a great way to get more involved in your local community while being part of a global movement. Through events like this, St. Jude is able to ensure families never receive a bill for treatment, travel, housing, or food and can focus on helping their child live. If you are interested in joining this committee and contributing to the lifesaving mission of St. Jude, please contact Matthew Bryant via email at matthew.bryant@stjude.org .